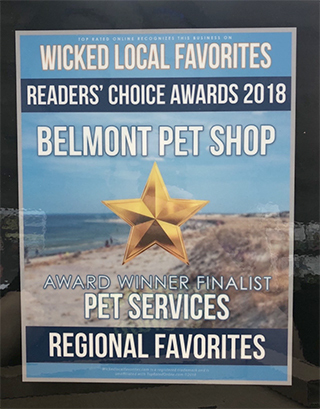 Belmont Pet Shop was established in 1948 in Belmont, Massachusetts. It has grown and changed a lot since then, but its number one goal has always been to provide the very best products, services, and advice to our customers. We pride ourselves on providing the highest quality pet foods for dogs, cats, small animals, and birds. If we wouldn’t buy it for our own animals, we will not sell it to you for yours. We are constantly educating ourselves on current events in the pet industry and training with the companies of the products we sell to always offer you the best advice for your pet. We also attend Global Pet Expo every year in search of new products and to attend seminars to keep your experience here top notch. Global Pet Expo is a pet industry trade show with over 3,400 booths and over 3,000 new product launches and 35 different seminars given by speakers who are at the top of the industry. Along with selling top quality products, we also offer full grooming services and small animal, bird, and reptile boarding. Please see our services page to learn more! If you’re looking for an all-in-one pet store in Belmont, MA, Belmont Pet Shop is the place to visit. We offer all of the most popular pet services including grooming, training and boarding, as well as a full line of pet products and pet supplies for your animals. We have an excellent selection of dog and cat food, leashes, collars, dog beds, cat toys and much, much more. Our full range of animal grooming services include bathing, grooming, hair trimming, nail trimming, gland expression, ear cleaning and just about anything else your pet could need. Going away on vacation? We also provide small animal boarding for reptiles, birds, hamsters, guinea pigs, ferrets, mice, rabbits, gerbils and other small pets in your absence. We offer high quality pet supplies and dog food in Belmont, MA and dog treats in Belmont, MA. We proudly serve the greater Boston area including Belmont, MA, Newton, Cambridge, Waltham, Concord, Lexington, Watertown, Somerville, Arlington, Brookline, Brighton, Medford and Winchester. We offer a huge range of pet products including cat toys, leashes, beds and dog collars in Belmont, MA. We are Massachusetts State certified pet groomers. We are members of The United States Humane Society, The Belmont, MA Watertown Local First and Cat Connection. "My pup Sunny LOVES this place. Ever since she realized that she can drag me by there on our daily walk she always stops by. The people there..."
Are you looking for a local pet store that has it all? 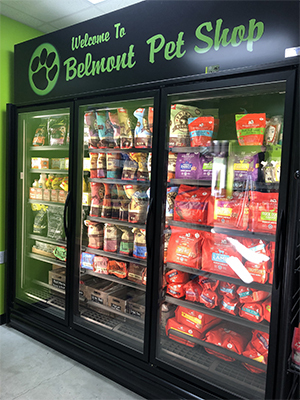 Visit Belmont Pet Shop to receive some of the best services and products in town.